After months of speculation and rumors innuendo (and out-nuendo - according to Glinda) the hit Broadway musical that is currently celebrating their first decade on Broadway recently landed to Manila for a limited run at The Cultural Center of the Philippines and puts Manila under their spell. Wicked: The Untold Story of the Witches of Oz is based on the 1995 Gregory Maguire novel - Wicked: The Life and Times of the Wicked Witch of the West. The multi-award winning musical uses music and lyrics by Stephen Schwartz and book by Winnie Holzman. Wicked reveals the friendship between Elphaba - The Wicked Witch of the West and Glinda - The Good Witch of The North before Dorothy dropped in. Sold out shows and an extended season greeted the Australian cast of Wicked: The Untold Story of the Witches of Oz when the musical started its run late January at the Tanghalang Nicanor Abelardo showing Pinoy theater fan's craving for a bite of this hit musical. I recently attended Wicked's charity matinee show with proceeds for the benefit of the Typhoon Yolanda - Haiyan survivors down in the Visayas region (and also watched an evening show a week after). It was a lovely afternoon to be at the grand theater to witness the musical live. As some of you know, I have been eagerly waiting for this musical to arrive in Manila for a few years now and I am thrillified that it finally landed in Manila. Fans arrived a few hours before the special show to take souvenir photos, merchandise, and just to actually feel the excitement of everyone. Cast members wearing their Ozian outfits surprised the audience for some photo opportunity before the show. The whole CCP building is decked out with everything Wicked. Aside from the Ozdust Botique and the photo walls, fans also took time to take their souvenir photos in front of the Land of Oz Map and cast photo wall. As soon as open house, everyone immediately rushed in to get into their seats. The Map of Oz with the glittering Emerald City greeted everyone together with the famous Time Dragon Clock which moves and lights up whenever there is magic happening on stage. Everyone took this time to take their souvenir photos with the set behind their back as there is a strict no-camera rule here like in every staged productions. I was in awe in how they transformed the Tanghalang Nicanor Abelardo into something this magnificent and detailed. It is noted that this production is a 1:1 copy of the Broadway counterpart, they took no short-cut in creating this beautiful scenery and production. Fast forward to the end of the show, a standing ovation was immediately given by the audience with a simultaneous applause from everyone. The two leads has really captured everyone during the show, -Jemma Rix who played Elphaba showed a powerful version of the green girl Elphaba, while Glinda played by Suzie Mathers had everyone in stitches with her portrayal of young funny girl who turned into a mature woman during the second act (Just a side note, Manila will be Suzie's last run as Glinda and you definitely need to watch her, she's brilliant!). I would also like to note Jay Laga'aia, the Great Wizard of Oz and Steve Danielsen who played the dashing yet deeply-shallow Fiyero for their wonderful performance together with the whole company who definitely kept everyone under their spell throughout the show. A special auction was held after the show where lucky bidders gets to win some Wicked items from the production. The auction was hosted by socialite and fashionista Ms. Tessa Prieto-Valdez who looked like she belongs in the production with her outfit. Items such as MAC Make-up packs, Backstage tours, and a special afternoon tea time with the casts were offered to the bidders. An online auction was also held where bidders gets to bid for Glinda's training wand, music sheet signed by Stephen Schwartz, a trip to London to watch Wicked at the West End, and a one in a lifetime opportunity to perform as one of the cast in one of the shows here in Manila. As the auction is taking place inside the theater, the ensemble is busy collecting donations from the audience. 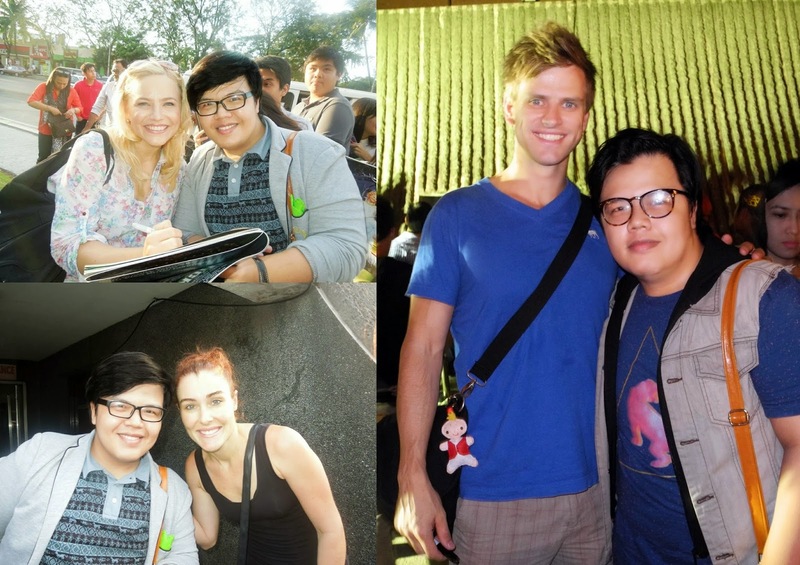 Fans took this opportunity to help out by donating while having their photos taken with the cast. Of course I didn't let this opportunity pass and we posted a photo with some of them. Wicked The Musical in Manila is definitely a thrillifying event that you shouldn't miss whether you're a theater fan or not -- it's definitely worth the money. Make sure to catch it while you still can because Wicked Manila just extended their season one last time before it officially closes on March 9th! Grab your tickets now by visiting any Ticketworld Outlets or visiting www.ticketworld.com.ph! Oh, one last thing! A lovely show wouldn't be complete without meeting the cast after the show, I managed to arrived on the stage door on time during the couple of times I watched and got the chance to catch up with the 3 lead actors of the show - Jemma Rix, Suzie Mathers, and Steve Danielsen, they were friendly and accommodating to everyone at the stagedoor. 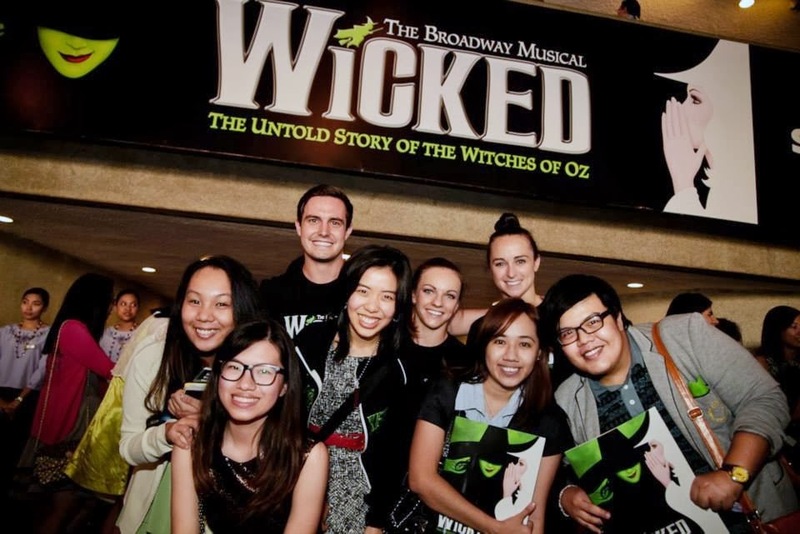 Want to check out more photos of our Wicked Manila adventure? Visit ALEXBAMIN3D.COM ON FACEBOOK for more photos! Where exactly is the stage door? I would also like to take a chance and get the cast autograph!